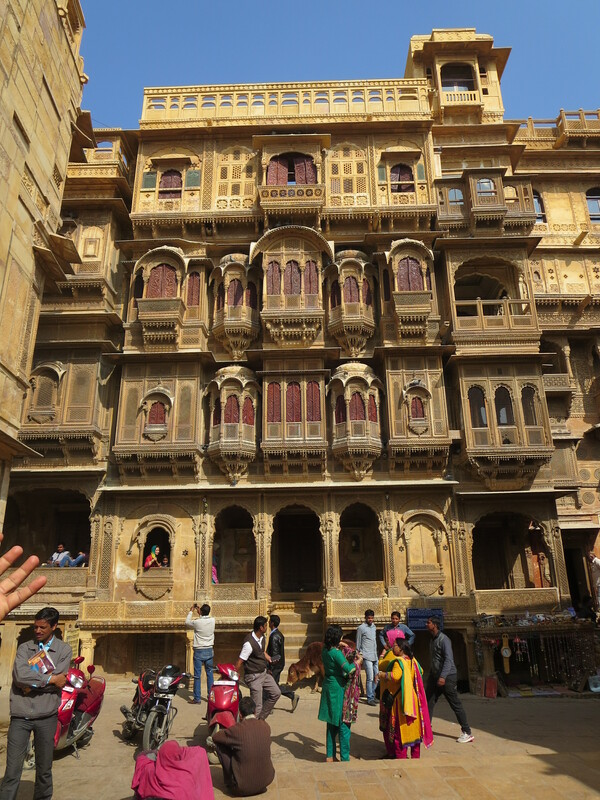 Jaisalmer is also famous for its Havelis. These are older than the Havelis in Shekhawati, dating back to the early eighteen hundreds. While the Havelis in Shekhawati are famous for their interiors, the Havelis here are famous for the exteriors. These are five Havelis in a row all built by one merchant, one for himself and one each for his sons. We get a little clarification on the silk route trading that made the merchants so wealthy. While our guide in Shekawahti said that they were trading spices, our guide here says that actually it was opium they were trading. So these so called merchants were actually drug dealers, and this apparently was the dealer of all dealers. How else could he have built five of these incredible Havelis. Our guide tells us that this is a shop selling dried poppy pods to opium addicts and it is all perfectly legal. Opium growing is controlled and licensed by the government and is only grown for medical purposes. The growers can only sell to the government who then sell it to the drug companies. But (and this will come as a surprise to you all) the government licenses more opium growing than the medical companies use. The government then sells the excess poppies to licensed traders. 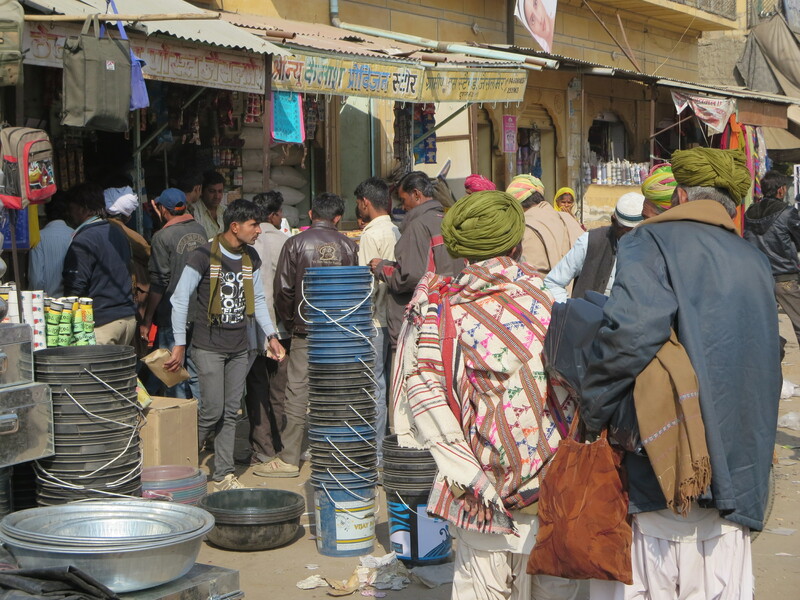 These traders are not allowed to make opium from the poppies. But they are allowed to dry them and sell them from licensed shops. They are, you understand, not selling opium. But addicts and soon to become addicts buy the dried poppies and make a kind of tea from them. It is much cheaper than opium, and not as strong, but it is addictive. In short, the governement is one huge drug dealing organisation. And if that doesn’t make them enough money, then all the licensing fees they charge do. We have spent two days walking around the town . The shopkeepers and Tuk Tuk drivers are all very friendly and begin to recognise us as we pass by. They all call out “hello handsome” to Gordon and completely ignore me. One asks Gordon if he is a movie star. It really is beginning to annoy me. However you can visit these camps for an evening, go for a camel ride in the desert, have a local meal and some cultural entertainment. It is of course very touristy, but our guide promises us that he knows a place away from the main tourist camps. The weather has been really cold, but today is the worst, plus the wind has become really strong. 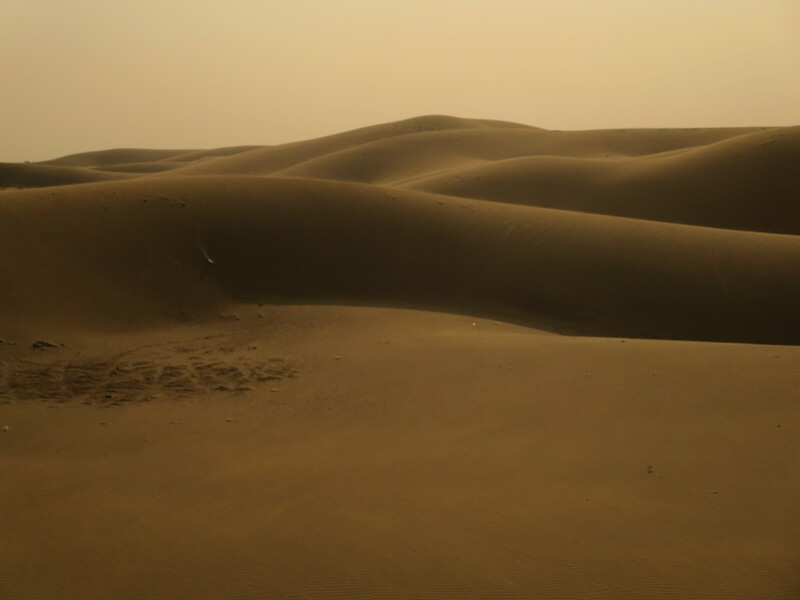 When we get to the desert camp, we discover that the guide is correct, it is away from the tourists – so far away that we are the only people there. There are two things that slightly spoil it for me. Gordon’s camel has Delhi Belly. I have no idea what it ate that morning, but what ever it was it ate a lot of it, and now it wants it out of its system. Unfortunately Gordon is leading and my camel is just a few feet behind. Every few yards, the tail of Gordon’s camel moves to one side as it spews out vast quantities of the the most disgusting smelling liquid. 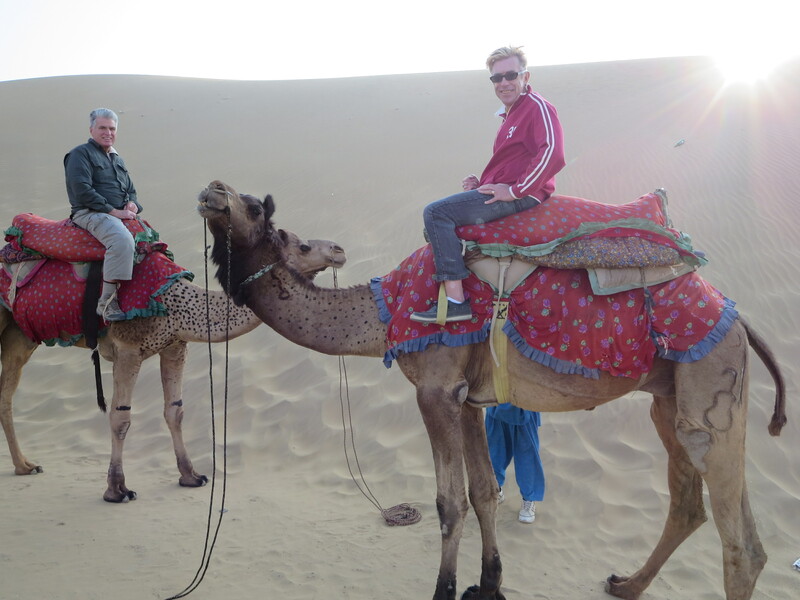 It runs down the camel’s legs and into the sand immediately in front of me. My camel simply walks through it. The wind blows the odour directly into my face. The other thing the wind is blowing at both of us is a lot of sand. Plus it is bitterly cold. The thought of an evening out here on our own has lost its appeal so we summon our driver and head back to town. We return to our favourite restaurant where we are greeted as long lost friends by the staff and the musicians. We meet an English couple who have just checked into our hotel and spend the evening with them. It turns out that they are not a couple, but are life long friends. He has just got divorced and she has lost her home to a fire. They decided to go on a trip together to cheer themselves up, but she made it quite clear to him that they were traveling as friends. However the more he drinks, the more we realise that he has not got the message. He tells us in front of her, that he really fancies her but she is keeping him at bay. He says that her head has been turned by all the wonderful looking Indian men in their turbans. We tell them that it just so happens that we have a turban that he can have. They both laugh. Whatever it is she thinks, she is too polite to say, but the look on her face suggests the dividing curtain will stay firmly closed. 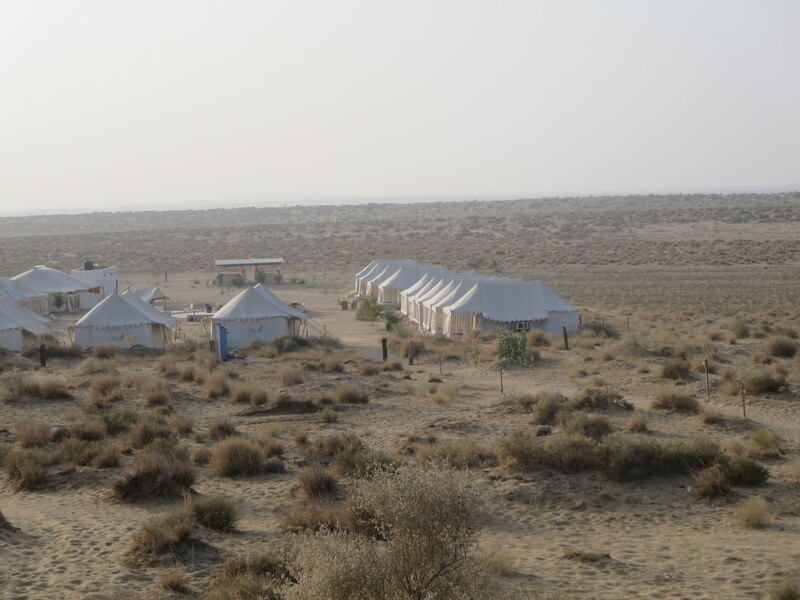 The next morning it is time to leave Jaisalmer. Our fellow guests do not emerge from their suite until 10.30. Either the turban worked it’s magic, or they have been arguing. We are too polite to ask, but romance is definitely not in the air. We let him keep the turban just in case. As we get into our Tuk Tuk to leave the fort , the local shop keepers and Tuk Tuk drivers all wave and shout “goodbye handsome”. I think just a few of them wave goodbye to me too. 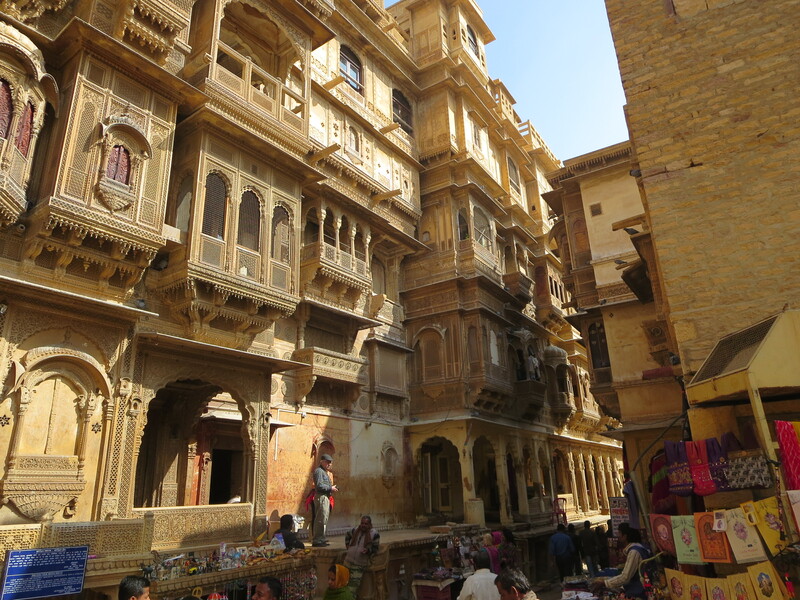 This entry was posted in India and tagged Jaisalmer. Bookmark the permalink. I can understand why you would not want to camp out in the dessert. Just think of the wind and how good it would be for a facial….. all that sand, blasting the visage!! And I was sure, handsomes, that you would be bringing the turban back!! We were out there long enough for some intense dermabrasion. . There isn’t a wrinkle left anywhere!! Andrew I have been thoroughly enjoying your travel blog for a while now. Thank you for letting all of us travel with you to these exotic places. I look forward to your blogs as much as I look forward to reading books by my favorite authors! I so enjoyed staying in the NYC condo that you had and always wanted to meet you. Now I feel I have , and you are even more adorable than I imagined( even if Gordon is the one with blond hair!) I look forward to reading your next chapter. Annette, what a wonderful and charming comment. You are making me blush.